Buoy 10 sits just inside the mouth of the Columbia, but fishing spans the Astoria-Megler bridge all the way to the Pacific. The Columbia river basin expands the closer you get to the ocean and is over 8 miles across at its widest point. That means you need a Buoy 10 fishing guide who knows every aspect of the river. With decades of local experience helping sport fishermen catch the biggest King Salmon and Coho salmon surrounding Buoy 10, Fish Hunter’s Guide Service will secure you the best opportunity for a prized catch. Land more with your local Buoy 10 fishing guide. Buoy 10 isn’t just a fishing landmark, it’s a way of life. Securing the best guided fishing trip means looking for local experience and a true dedication to the craft. Identifying the best location to catch Chinook King salmon and Coho salmon is about more than analyzing fishing charts. Travis knows the entire Columbia basin including the best spots around Astoria Hammond and Astoria tongue point. Making sure your trip is everything you hoped for means preparation, and Travis prepares year-round. As an Oregon and Washington fishing guide, Travis knows that not every fisherman is looking for the same experience. Some want a fish they can proudly display, others are looking for poundage, and some want the toughest fight they can get. He has spent years honing his abilities and spends painstaking hours customizing every single trip. Choosing Travis as your guide gets you more than a guided fishing trip, it gets you the preparation required for the ultimate catch. This is hands down one of the premiere fisheries in Washington and Oregon. The Columbia River stock is the largest run of Chinook and Coho in Washington and Oregon. These giants are known as up river brights. They average well over twenty pounds with thirty and forty pound fish being common. Boat limits are the regular for this great fishery. We start off in early August targeting these upriver bright Chinook at the mouth of the Columbia River where it meets the ocean, otherwise known as the famous buoy 10. We troll herring and deploy homemade spinners for these upriver bright Chinook. After these fish make their way up the river we follow them up and anchor fish in the Columbia River near Longview, Kalama, and Woodland. Occasionally we chase them all the way to Bonneville Dam and the Bonneville pool for some great late season fishing all the way through September. Come October we move into the rivers and fish through November. We will be back bouncing bait and trolling plugs. Our fisheries are the Cowlitz, Lewis, Klickitat, and Drano Lake. The numbers of fish hooked and landed are consistent. 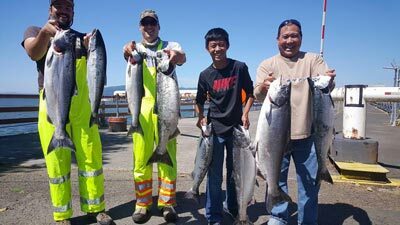 Contact us to schedule your Buoy 10 salmon fishing expedition today. The Columbia is waiting and we’re ready for it. When you want a local fishing guide service captained by a Buoy 10 veteran we’re always prepared. Enjoy everything the river has to offer and have the experience of a lifetime. Call or contact us today to schedule your guided trip now and for Steelhead fishing guides.